Click the pic for a closer look. Okay, the blue willow painting didn’t work out. Sadly, it won’t be coming home with me. So, here we are..another Corkboard with plans for the living room. This time a pair of nature prints from the collection at the New York Public Library is the focus. I think the patterns in the butterfly wings play off of the colors and shapes in the vintage japanese and african fabrics we’ll be using for pillows. Click the pic for a closer look. 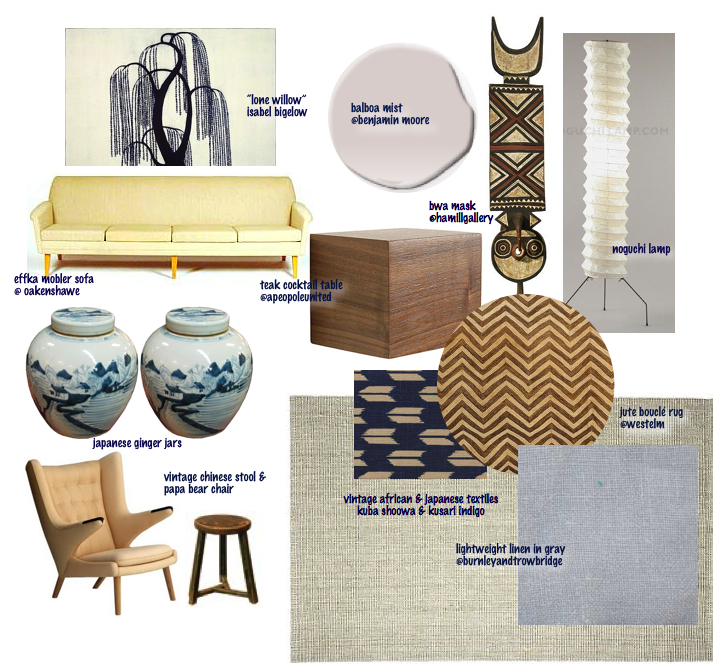 A third cork board in my set of plans for the living room, Afro-Scandi. The sculptural shapes and a mix of global patterns are the focus this time around. The influenced palette is the same as in previous versions of the room– blue, brown, black, white, gray, rust and indigo. Here, it feels quiet, warmer and more homey, I think. Inspiration for the Afro-Scandi style–Joelle Le Bussy’s work above. Thanks to Pattern and Texture By Essence for posting the photo. 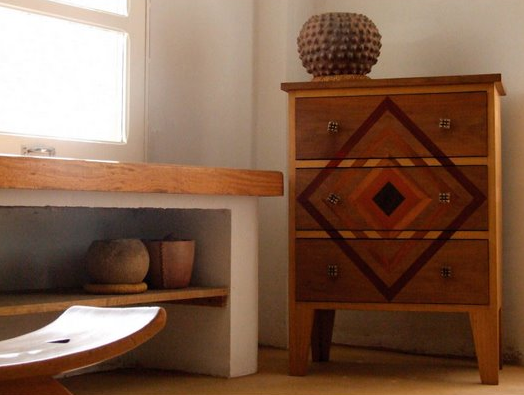 You can see how heavily Scandinavian design was influenced by African form. The Telegraph shot Andrew Bannis’ mix of indigo resist and batik patterns in his London loft. 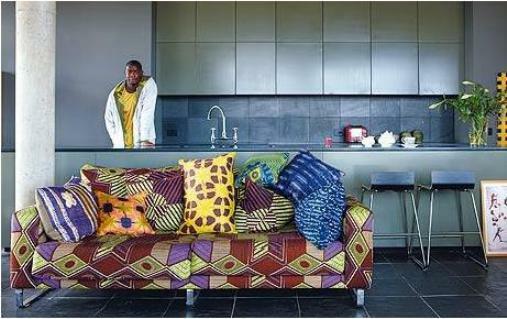 Bannis’ design firm, Royal Hut produces cushions made from beautiful African textiles. He’s achieved cozy minimalism. Click the pic for a closer look. We into week two of the Apartment Therapy cure now. I know it usually begins every March, but we need a jump start so we’re deciding the purpose for the living room and defining our style. 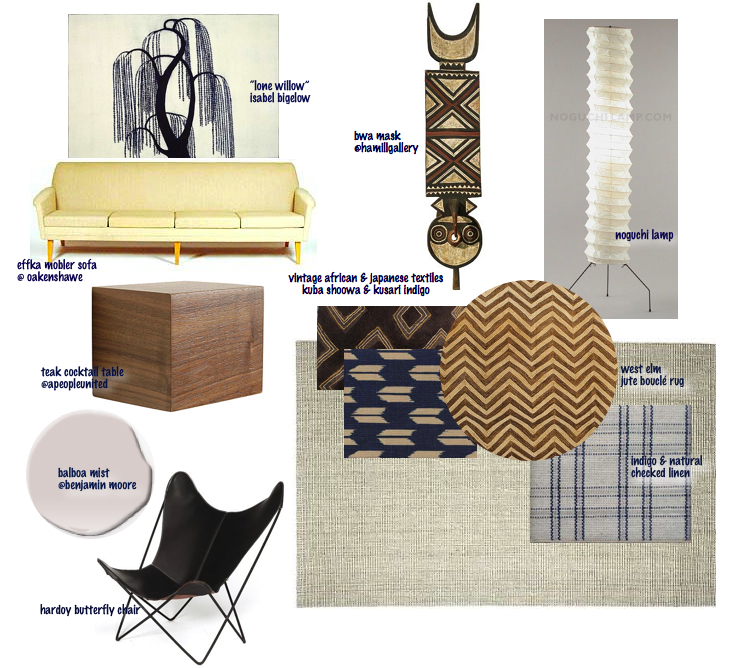 Here’s my virtual cork-board with design plans for the living room–Boho-Antique: classic designs with far-away flair and heirloom pedigree. It’s filled mostly with things that we already own which means the budget will be small. The traditional blue and white color scheme is tempered with black–like my favorite traditional Japanese rooms. There are lots of timeless references in updated and “exotic” mediums. 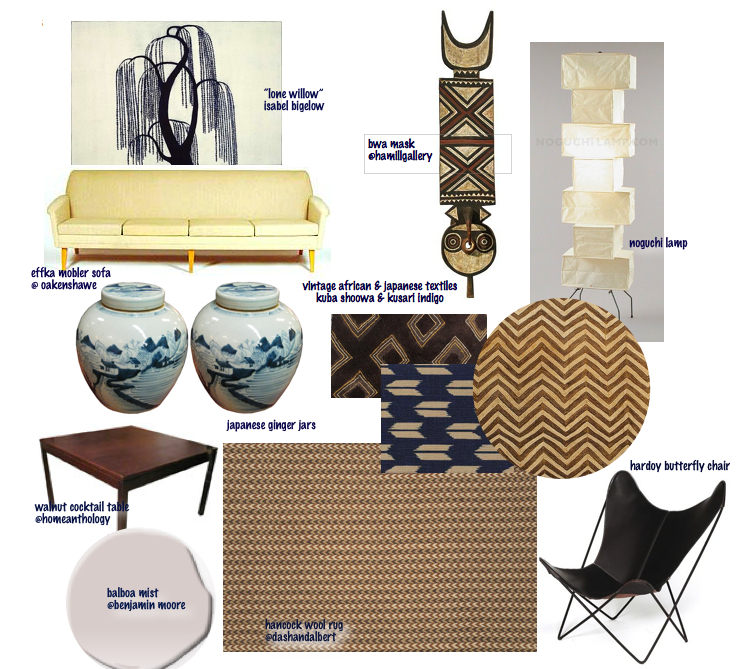 Chevron prints in the African fabrics, a mid-century sofa in a Georgian shape, a painting of a stylized willow tree lifted from a piece of Imari porcelain. 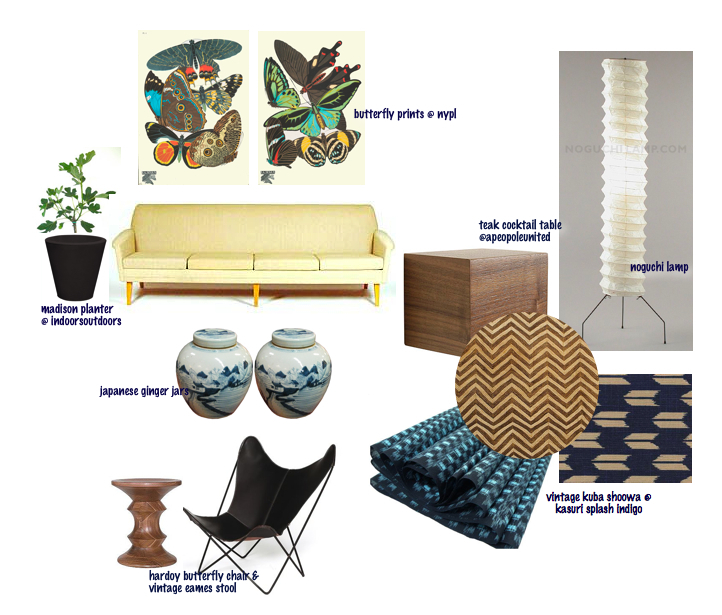 The Hardoy chair, Noguchi lamp and parsons style walnut table are new classics that will last through trends.